The practice of applying ink to paper and composing a beautiful letter — a custom already in decline in the West long before the insidious tyranny of email — remains fairly common in contemporary Japan, especially among women. As you might surmise, however, the exquisiteness of the presentation (think of the cuisine of this archipelago) matches or even outweighs in importance the actual contents of the message. Hence, great emphasis is placed on the look of the pen- or brushwork, the choice of a postage stamp, and above all, the design and character of the stationery. Such is the significance of just the writing paper and envelope that — forget duty-free Chanel — it is unique, attractive, distinctively-decorated letter sets that my lady friends implore me to discover and carry back for them from each trip abroad. But because the stationers I stumble upon overseas sell only saccharine matrimonial designs (plus some faux Japanese washi), I always return with nothing better than museum gift shop note card sets. These the women accept with grace … and promptly file away in a remote drawer. Dare I suggest to the well-bred but disappointed women that they might do better by staying within their own tradition and supplying their writing paper needs from the bins of old book fairs? For it is in such places that one finds long ago discarded tenaraichô, beautifully-illustrated poem and letter-writing stationery. Tenaraichô (lit., "notebook for training the hand") comprise one of the many forgotten products of the woodblock print industry in Edo and Osaka in the middle of the 19th century, a time when important correspondence demanded proper presentation. Tenaraichô (also called ebangire, or illustrated half-size paper) consist of a sequence of stencil or nishiki-e printed sheets — each measuring 31x43 cm — that have been pasted end to end to form a single expanse a few meters long. Folded accordion-style, the sheets are reduced to numerous narrow (tanzaku–sized) sections, each just wide enough to allow for a few variable-length vertical rows of calligraphy. With the first and last flaps attached to thin slabs of paulownia wood, the result is a sturdy, compact "washi sandwich," a handy format also used traditionally for important proclamations and Shintô prayer booklets. The fact that a tenaraichô fits easily into one's palm makes it more convenient than a hand-scroll, and the way the message unfolds — incremental soupcons of the woodblock design alongside mini-installments of text — is both more intimate and more fun. Fig. 1 is an example of how a single sheet of a tenaraicho looks when it has neither been folded nor written on. 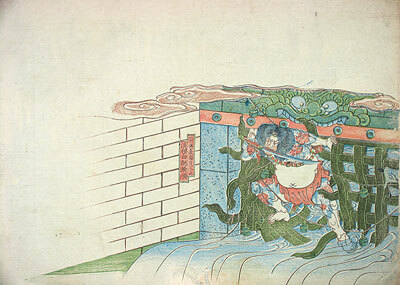 In this case, the placement and exceptional boldness of the illustration — the tattooed rebel Rorihakuchô Chôjun forcing his way through the bars of a watergate, from chapter 118 of Suikoden (The Water Margin) — forces the calligrapher to think of a graceful way to curve the brushwork around it. Far from a hindrance, this challenge would have been welcomed by most refined poem or letter-writers, as would all the variations in the placement of the composition on subsequent sheets. Note in Fig. 2, a fully assembled but also unused tenaraichô — folded here in such a way as to reveal parts of the first and last sheets (the opening and closing chapters of the classic revenge tale, Chûshingura or The 47 Rônin) — how there can be variations in color intensity, as well. Generally speaking, the further one progresses into a tenaraichô (which, by the way, are invariably unsigned), the fewer in number and paler become the pigments. Thanks to the intense blackness of good sumi ink, words can be brushed right over such lightly-printed ukiyo-e and still be very legible. The size of the imagery can also gradually diminish. 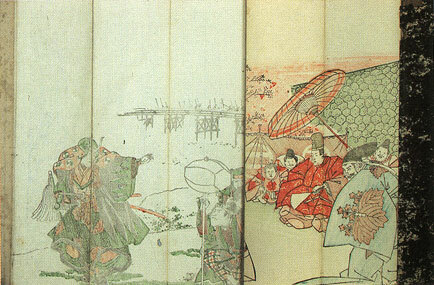 In this connection it should be mentioned that in many tenaraicho the design is executed with merely one or two thin hues throughout the entire length, and no individual composition strays above the lower third of the sheet. Bucolic landscapes along a famous river are ideal for this type of user-friendlier "cho," which assuredly represented a more economical (as well as more feminine — perfect for my charming ladies) approach to stationery design. It seems that the market for tenaraicho was once as segmented as the glorious letter set package itself. This article originally appeared in Daruma, no. 49, Winter 2006. Copyrighted © text and pictures reprinted with permission.